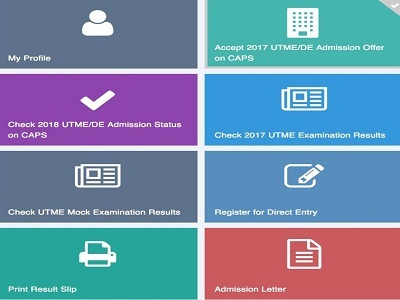 It is common lately that candidates seeking admission are being offered admissions into different schools other than the ones chosen in UTME. In other words, when applicants check their admission statu, they see a completely different school other than the one chosen in JAMB or the one they are expecting an admission from. A related condition is when you actually chose a school but you preferred admission from another one. For example, you chose a university and a polytechnic in JAMB. You might have actually attempted the two schools’ post-UTMEs. This is the JAMB CAPS interface. However, you prefer admission from the university instead of the polytechnic and vice versa. You know, with the performance in your university’s post UTME that the school should give you admission but unfortunately, you got an offer from the polytechnic you prefer least or a private institution for that matter. Then, what should you do in this situation? See: Can JAMB Give Admission from Two or More Schools to a Candidate Through CAPS? First, let’s see why you can be offered admission from a strange institution. You didn’t choose a school but when you check your JAMB CAPS, you see them offering you admission. This is possible. JAMB usually gives access to students’ data to schools that have spaces for admission seekers even whether you chose them or not. Such schools will then see if you meet up with their entry requirements. If you do, they can offer you admission. If you chose two schools and you’re expecting admission form either of the two. The one that is faster can offer you admission in order to win you over the other competing school. In either case, below is the guide to follow. If offered admission by a school you don’t want, you should reject it. This gives room for another school to propose you their offers. But before you reject an offer, be sure that the school you’re opening up for will definitely give you admission. For if you reject an offer, and the other school doesn’t offer you admission, you’ve just signed in for the next year JAMB. A lecturer, professor or someone in charge of admission has guaranteed you that you will be offered admission by the school based on your performance or connection. In the absence of the above, don’t risk things. But I’ve Already Accepted it, What Can I do Now? This is equally common. It’s just happened to a candidate seeking admission to Osun State College of Technology, Esa Oke but already offered admission by Abraham Adesanya College of Education. The candidate actually applied to the two schools. Not knowing the implication, he accepted that of the college on JAMB CAPS. The admission office at the Polytechnic could not offer him admission again unless he can do the following. This office will forward this to JAMB - along with the candidate’s information. It will be contained their own letter that the candidate prefers them over the other school. As a matter of fact, you don’t know this situation can arise until you or someone around you fall a victim. But this shouldn’t pose any threat if you know how to go around it. This is why you should share this information with your contacts on Facebook, Whatsapp and Twitter. You will save some people from an unnecessary headache. It also matters to me too. Use the share icons below this post for your convenience.